One of the most frustrating effects of your on-the-job injury relates to the financial distress that it may cause. 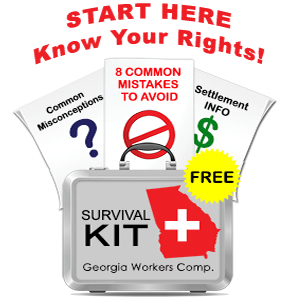 If your employer does not fight your claim, the most you can recover per Georgia law is 66 2/3 of your average weekly wage, with a cap of $575 per week, which translates to $29,900 take home pay annually. If you are used to bringing home more than $500 per week, or worse, if your employer controverts your claim, you could find yourself with significant financial hardship. Further, even if your employer picks up your claim, you will end up with out of pocket costs that may or may not be reimbursed. Chapter 13 bankruptcy functions as a repayment plan. In cases where you have fallen behind on your mortgage or car note, Chapter 13 stops foreclosure or repossession and gives you up to 5 years to pay back missed mortgage payments, while restructuring your other debts. Chapter 13 requires a “regular source of income” and workers’ compensation payments do qualify as an acceptable source of income. The question, however, is whether your workers’ compensation payments constitute enough income to meet your regular budget items as well as fund a Chapter 13 plan. One of the issues that can arise in a Chapter 13 funded fully or partially by workers compensation payments is “feasibility” – does the math work? Another issue that usually comes up in a workers’ compensation funded Chapter 13 has to do with settlement. Do you get to keep the settlement money, or must you send some or all of your settlement to the Chapter 13 trustee. The answer to this question about settlement is “it depends.” Under Georgia law, workers’ compensation settlements may be “exempt property.” Exempt property is not part of your bankruptcy estate and cannot be claimed by either the bankruptcy trustee or creditors. In my experience, a workers’ compensation claimant can argue that most or all of his settlement is exempt if those funds will be used for future medical care and if the claimant’s earning capacity has been temporarily or permanently reduced because of his injury. For example, I successfully argued in Bankruptcy Court that an $85,000 workers’ compensation settlement should be considered fully exempt because my client had on-going medical care needs, she was not employed and would likely not be returning to the workforce for 6 months to a year and because she had fewer job options as a result of her injury. On the other hand, you may propose a “step plan” in Chapter 13 whereby you pay a reduced monthly payment at the beginning of your case, but promise to send in a lump sum at settlement to satisfy the demands of creditors and the trustee. As you can probably sense, your workers’ compensation case adds a layer of complexity and uncertainty to your Chapter 13 case, and both your workers’ compensation lawyer and your bankruptcy lawyer will need to file extra paperwork and coordinate efforts.